In part one of this series on soloing over minor seventh flat-five chords I discussed the basic music theory involved and suggested ways to use arpeggios using the members of the chord. If you need to brush up on any of this, click here. In part two I'm going to first go through some music theory regarding scales and then highlight some of the specific scales we can use to improvise over minor seventh flat-five chords. Imagine you are eight years old and you have a toy train whose cars are labeled alphabetically. The engine is letter A, the second car is B, the third car is C, all the way back to the caboose which is labeled - you guessed it! - G. (That's the musical alphabet in case you didn't catch it!) Here's our musical train groovin' along the track in scale order. By the way, this particular railroad company is the NMSR - the Natural Minor Scale Railroad. Wouldn't it be cool if railroads actually sounded like scales when they crossed in front of us while we're waiting at an intersection?! Here's how our train scale looks in staff and tablature notation. I've added an extra A at the end so it sounds complete. Now let's work for the railroad and modify the train so that it uses every-other-letter-name-alphabetic order - the system used with chords. But let's start simple - just three cars long: A, C, and E - the notes in an A minor chord. Wouldn't our railroad cars sound lovely - though perhaps sad - at the intersection? Notice in the music notation below how we've taken every other letter name from the A natural minor scale, using only the letters A, C, and E. The A minor chord is shown in the second measure. In it's simplest form this is how scales and chords are related. This is one way we can figure out which scales sound good with which chords and vice versa. In our example above, since the A minor chord is constructed from an A natural minor scale, they should sound good together. After all, they're cut from the same cloth. 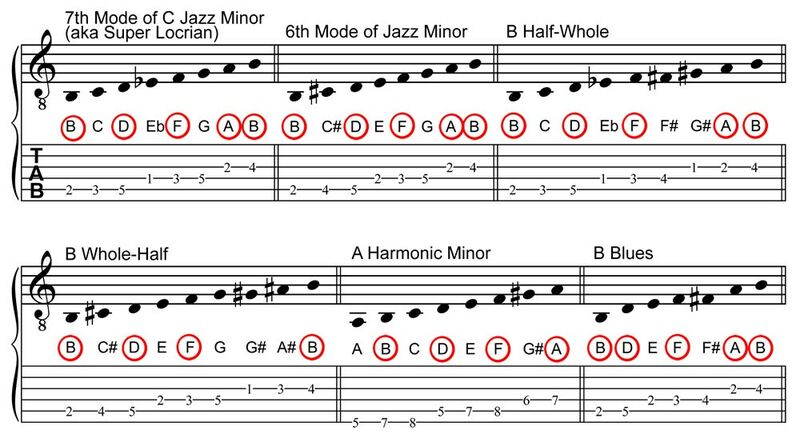 Most jazz tunes use chords with at least four different letters names (seventh chords) and as many as seven unique letter names (thirteenth chords). Why is the fourth note of a seventh chord called a "seventh"? Because using the every-other-letter-name-alphabetical rule, the fourth note of a chord is the seventh note of the scale. Simple, but strange, right? Let's up the ante a little and create a minor seventh chord. It's easy! Just start with the first note of an A natural minor scale and use the next three every-other-letter-name-alphabetical notes. We end up with A, C, E, and G. This is called an A minor seventh chord. (As much as I'd like to, I won't be going into how we name these chords or label them major, minor, diminished, augmented, flat-seven, sharp-eleven, etc. It's a subject for a different article.) Here's our choo-choo train and music notation. As you can probably imagine, our steadfast A natural minor scale will work great for soloing over an A minor seventh chord. But as you might be able to foretell, finding the same number of scales for this chord as we did for the A minor chord above will be a feat too great for Sisyphus. (I hear that Sisyphus loved barre chords. Go figure!) Since our new minor seventh chord contains four unique letter names, as opposed to three for the a minor chord (that's why it's called a "triad" by the way), there just aren't as many pigs in the pigpen to choose from. If you take a look at the list of twelve scales above, after removing the ones that don't have any G letter names, the list gets pared down to ten. Not bad right? But just imagine what's going to happen when we use chords with five, six, and seven unique letter names, such as A minor ninth (Am9 - A, C, E, G, B), A minor eleventh (Am11 - A, C, E, G, B, D) or A minor thirteen (Am13 - A, C, E, G, B, D, F#). The possible scales will dwindle down to a very few in the case of the latter chord. To have more choices with this last chord, we will have to dig into our scale sack and pull out some new and exotic scales! Yahoo! But before we go to such lengths, take a look at how the Dorian scale in A corresponds exactly with the notes in an Am13 chord. If you're wondering why there would be an F# in an Am13 chord, the explanation would take more space than I can get into here. But let me just say that music theory is full of quirks and this is one of them: We use the letter names from major scales once we get to chords with four or more unique letter names - even if the triads they are based on are minor, diminished, or augmented! Music theory is stranger than fiction! Without getting into any more examples, I hope you can see how chords and scales can be thought of as two different sides of the same coin. This approach will give us lots of scales to use with minor seventh flat-five chords, which is what I'll turn to next. In part one of this two-part article on soloing over m7b5 chords, I explained that these chords usually occur on the 7th scale degree in major keys and the second scale degree in minor keys. This makes a strong case for using scales that occur on those scale degrees. We used the Bm7b5 chord for the examples in part one. Let's continue with that chord since it is the simplest to work with, constructed as it is of the natural notes B, D, F, and A. The C major and A natural minor scales are constructed using the same letter names: A, B, C, D, E, F, and G. The only difference between them is that the C major scale starts on the letter C while the A natural minor scale begins on the letter A. If we instead use the same letter names while starting instead on B, the root of a Bm7b5 chord, we discover that this scale too has a name: the B Locrian scale. The seventh mode of a major scale is called the Locrian mode, i.e., starting on the seventh scale degree of a major scale is called the Locrian mode. Therefore, the most obvious scale to use for a Bm7b5 chord is B Locrian. Notice that four out of seven of the notes in a Bm7b5 chord are found in the B Locrian scale. This would probably be the easiest and most theoretically sound scale to use when improvising over a Bm7b5 chord, especially if the chord is used in its most common way, i.e., as the seventh chord in a major key or as the second chord in a minor key. But as we saw in the theoretical discussion above, we are not limited to one particular scale when soloing. There are usually lots of choices. Theoretically any scale that contains the notes B, D, F, and A will work in some fashion. Even scales that have some of these notes but not all of them may prove useful. I hope you have found this two-part series on improvising over the minor seventh flat-five chord helpful. There are many more techniques for improvising that I hope to explore in future articles. Please check back often for updates!